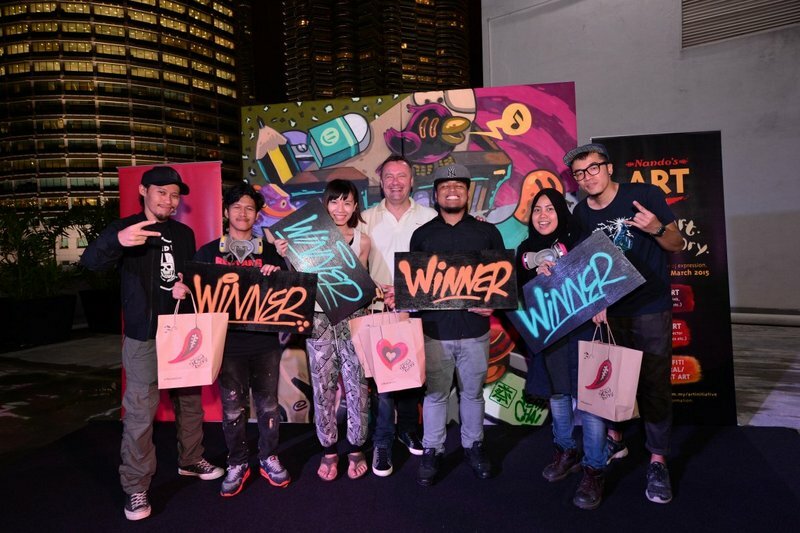 After two whole months of sifting through submissions, 10 of the top graffiti artistes, that had exhibited impeccable talent, made their way to the final round of the Nando’s Art Initiative 2015 competition. 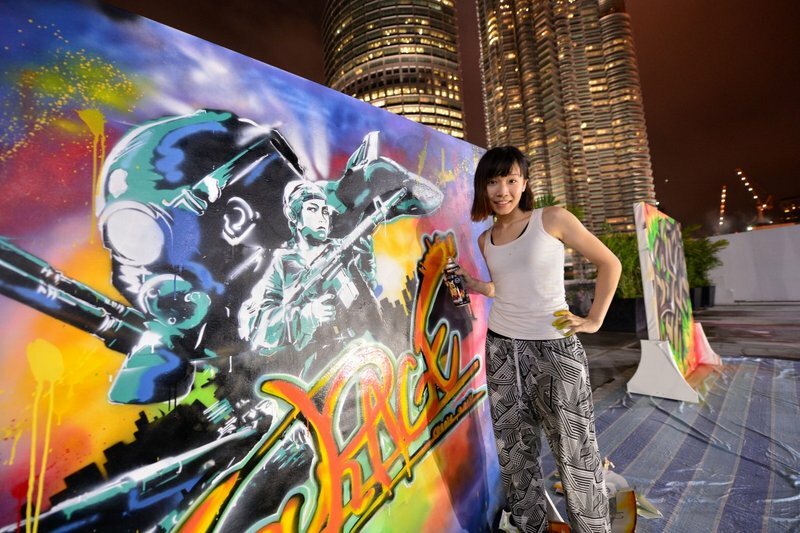 The live showdown hosted on the rooftop of Avenue K saw each participant bring their A-game to the canvases as they immortalised their rendition of ‘Your Art. Your Story’ through vivid imagery and letters. 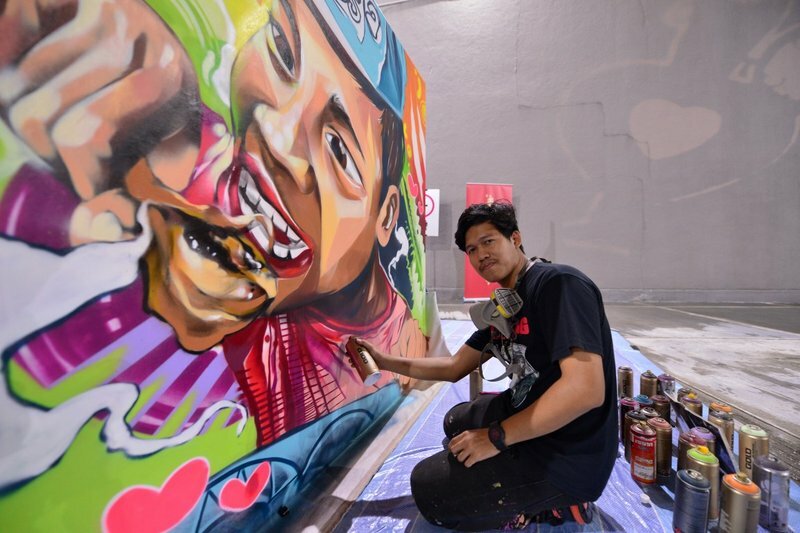 Nando’s introduced the Graffiti Art category last year to an encouraging response of 36 submissions from young Malaysians of diverse backgrounds, from college and university students to young self-taught artists. The art form which has been creating headlines all over the country has built a solid following and is embracing urbanites with a growing passion. “Nando’s is constantly looking for opportunities to create a platform for Malaysia’s artistic youth to hone their talents. From the headlines we have seen lately, street art is definitely something that interests them as it is a refreshing and powerful medium of expression and dialogue. However we at Nando’s feel that Graffiti has yet been given the status of Art and we intend to change that perception with our Graffiti Jam,” said Ian Cruddas, CEO of Nando’s Chickenland Malaysia Sdn. Bhd. he participation rate for Graffiti Art this year increased to 56 submissions. The top 10 finalists that were shortlisted consisted of four college/university students and six young artists who pursue Graffiti as a passion and a career. 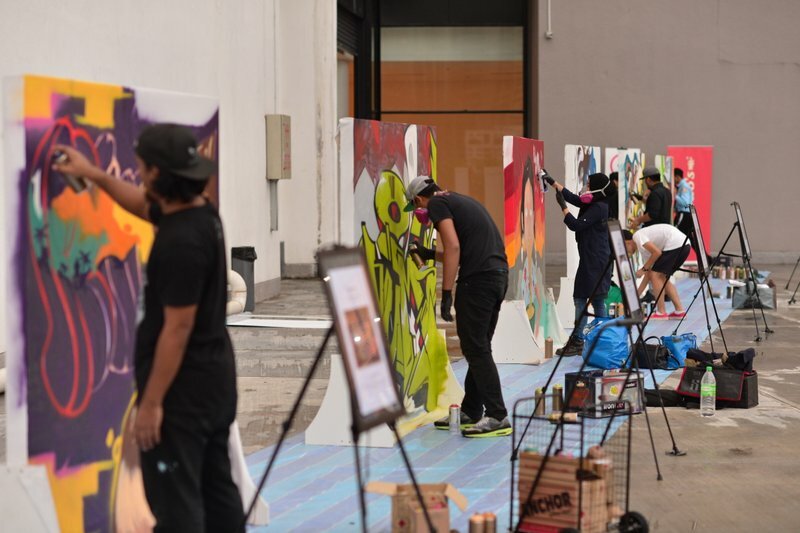 To crown the winners of this year’s competition, Nando’s held an energetic live Graffiti Jam in order to better evaluate the artistic skill required to produce each individuals masterpiece. These aerosol artistes are all highly motivated with the desire to create, not destroy. The battle, which kicked off at sundown involved judges, Ian Cruddas, CEO of Nando’s Malaysia, Kenji Chai a formidable name in the Graffiti Art scene, Syed Nabil, Chief Advisor for Nando’s Art Initiative and the Godfather of Street Art himself, Phobia a.k.a. Bee along with hard-core partisans from the scene. With the competitors already fervently working on their artwork, the Graffiti Jam was well on its way when guests arrived. 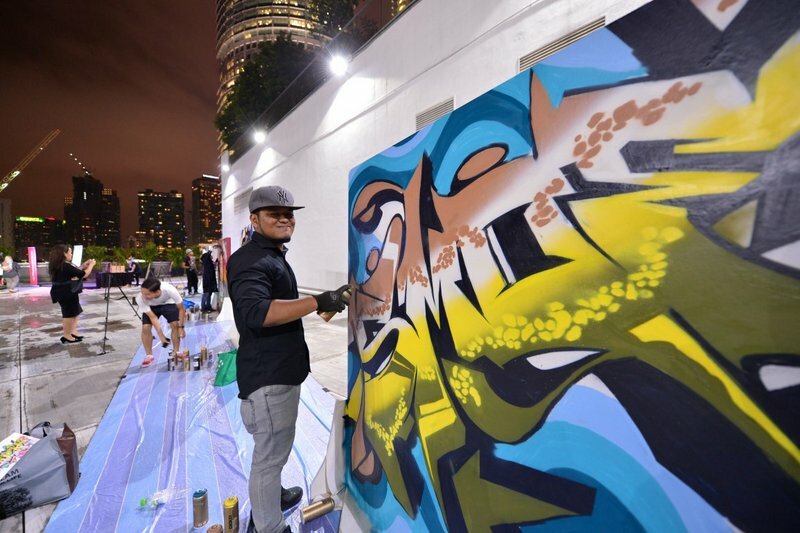 To further get everyone on the bandwagon, attendees were given the opportunity to try their hand at Graffiti under the tutelage of renowned Graffiti artist, Kenji Chai and last year’s winners of Nando’s Art Initiative Graffiti category, Lok Chern a.k.a Cloakwork and Edmund Yew a.k.a Nestwo. The night soon came to a halt as the sirens blared, indicating the final countdown of the contest. The trepidation and anticipation among the competitors were palpable as the judges made their rounds checking on each participant’s finished product. Once deliberations were over, Chong Hong Shi with her artwork entitled “Courage”, Amirul Shah Bin Mumfahir with his colourful piece entitled “Fusion”,Nurul Syakirah Saparudin with an artwork inspired by her daughter entitled “Eating Celna”, and Mohd Zulfadli bin Ahmad Nawawi, were sanctioned as the Nando’s Art Initiative top 4 Graffiti finalists. Mohd Zulfadli definitely satisfied his need for ‘more’ as he was also the ‘Media Favourite’ for the night with his artwork entitled “I Need More”. “Graffiti has come a long way since it first came on the scene and it has evolved into a social expression of some very talented individuals. Today, you can clearly distinguish between a masterpiece and something that is just scribbles on the wall and we believe that by giving these people an avenue to showcase that talent and then exposing the public to such amazing creativity, it will help educate, promote and grow this art form further,” continued Ian. To find out who among these four talented artists will be the Graffiti Grand Prize Winner, be sure to join the Nando’s Art Initiative 2015 Grand Finale on 27th May at Publika! The Nando’s Art Initiative 2015 Grand Finale is more than just a prize giving ceremony for the Fine Art, Digital Art and Graffiti/Street Art category. There will also be an exhibition running from 27th May until 7th June for the artworks that were submitted for this year’s competition. At the Grand Finale, Nando’s will be giving away prizes worth up to RM85,000 following the categories below. This entry was posted in News and tagged art, nandos by TheGoodGoodGuy. Bookmark the permalink.